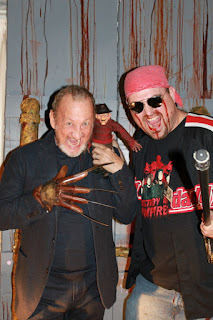 I've written about Freddy Krueger more times than I can count. In fact, come to think about it, I've probably written about him more than any other subject. To me, no bigger film icon exists. That includes James Bond, Darth Vader, Don Vito Corleone, ANYONE. Plain and simple. Freddy is KING. There is no greater villain and no greater horror icon than Freddy. The Nightmare on Elm Street movies represent when horror was entertaining and didn't take itself so seriously. Freddy went from scary burnt faced mofo to maniacal merchandising maniac pretty quick. And that was pretty cool. Sure, his origins were deep rooted in being a killer but it's when he made the leap from dark and dry to wild and goofy that he hit his stride. I mean, lunchboxes, pajamas, action figures, comics, everything you can think of! I love super dark Freddy, don't get me wrong, but Freddy cracking a joke while forcefeeding the intestines of his victim to themselves? Even better.